The music to The Minstrel Boy is set to the melody of an old Irish 'Air' called The Moreen , while the lyrics were written by Thomas Moore - an Irish singer, songwriter, poet and entertainer from Dublin, Ireland. 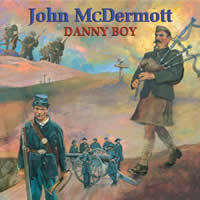 This version of the song by John McDermott is featured on his album Danny Boy. Easier: Play in D Major (capo on 1st fret if playing with video). In the Intro, the violin brings the band in with a note played on the 4th beat of the 1st bar. The band comes in on the second bar. There are several chord changes in the 4 bars of Intro. If you find this a little hard, simply play the same chords as the 4 bars of instrumental breaks in the middle and end of the song. A hyphen between 2 chords splits the bar count in half, therefore | D - G | with 4 beats per bar means 2 beats on D and 2 beats on G... could also be written as | D / G / |. | G A D / | means 1 beat on G, 1 beat on A, and 2 beats on D. This simile mark or repeat sign ( / ) means you repeat the previous chord in the same bar. The song tends to start and stop and change tempo, but this is the nature of the song. John is a great Tenor, and sings the song beautifully. 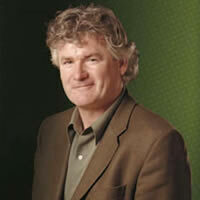 JOHN MCDERMOTT chords and lyrics are property and copyright of their owners. "The Minstrel Boy" chords and lyrics are provided for educational purposes and personal use only.